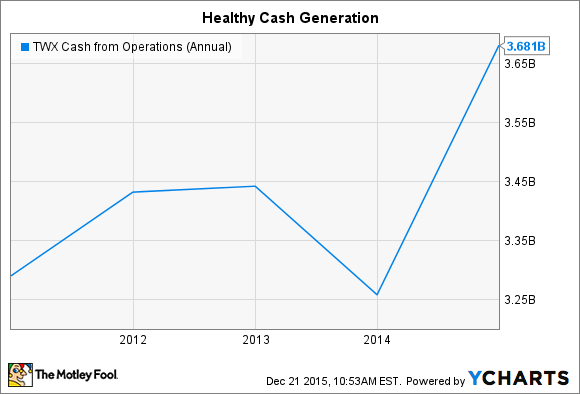 Will Time Warner Inc. Raise Its Dividend in 2016? Income investors got a double-digit raise in 2015. Is another big boost in store? 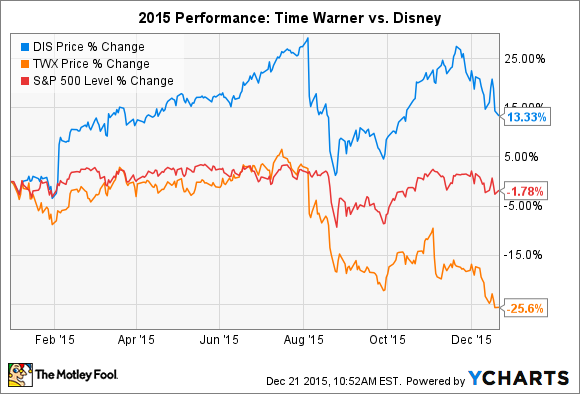 Time Warner (NYSE:TWX.DL) investors didn't have a great 2015. Their stock fell by roughly 25%, compared with a 3% loss for the market -- and a 15% gain for fellow media titan Disney (NYSE:DIS). Yet Time Warner's dividends tell a happier story. In 2015, Time warner raised its payout by 10%, marking the sixth consecutive year of double-digit dividend hikes. The divergent stock price trajectories have also ensured that Time Warner's yield, at 2.2%, is comfortably above Disney's 1.4%. With that bigger picture in mind, let's look at what income investors can expect from Time Warner in the year ahead. Through the first nine months of 2015, Time Warner posted a huge jump in operating income. And that improvement has been broad-based: All three of its main business divisions kicked in solid profit and revenue gains. Turner, the television broadcast segment, is Time Warner's key profit generator. And that unit has turned in soft results. Advertising revenue is flat, year over year, and subscription revenue slipped lower by 1%. Yet these weak numbers are showing up everywhere in the TV business. Disney, for example, worried investors when it recently posted a significant decline in ESPN subscribers. Warner Bros studios has had a great year, thanks to video game hits including Batman: Arkham Knight. Image source: Time Warner. Like Disney, Time Warner's diversity allows it to survive hits to one area of the business by managing growth elsewhere. Its Warner Bros studios really stepped up to the plate in 2015, logging company-leading sales and profit gains thanks to a slate of blockbuster video game titles that put the company in the same league as pure-play publishers like Activision Blizzard and Electronic Arts. Altogether, Time Warner's sales rose a healthy 6% through the first three quarters of the year, even as costs fell sharply. The result has been a 53% spike in operating income, to $3.3 billion. In addition to profit, cash flow is another important metric to watch, as cash flow most directly funds the company's increasing dividend commitments. The most recent 10% dividend boost, for example, closely matched the 12% free cash flow gain that Time Warner logged in 2014. The good news for income investors is that, through most of 2015, the picture looks similar to last year's. Time Warner has generated $2.9 billion in free cash flow, up 14%. TWX Cash from Operations (Annual) data by YCharts. CEO Jeff Bewkes and his executive team have shown a partiality toward stock repurchases over dividends. The company spent $3 billion on buybacks, compared to $869 million on dividend payments, over the first three quarters of the year. Countering those financial improvements is an expanding debt burden. Time Warner's net debt has crept up to $21.2 billion from $19.8 billion a year ago. Still, the overall picture looks good for another hefty dividend boost in 2016. While the cable TV section of the business has its issues, Time Warner's diverse enterprise continues to produce profit gains. Free cash flow is strong, and the billions of dollars in annual stock buyback spending demonstrates that this media giant has the finances available to keep its streak of significant dividend raises intact. Meanwhile, the payout ratio, or percentage of earnings dedicated to the dividend, is a manageable 31% over the past 12 months. That's below Disney's 36%, and well below the broader market's 50% payout average. Put all of this together, and Time Warner investors are likely to see a solid dividend boost when the company posts its fourth-quarter earnings results in February.